Ticketing startup Eventbrite today added a major new feature to its platform with the addition of reserved seating options for ticket sellers. Previously, Eventbrite only dealt in general admission tickets, but now you’ll be able to sell specific seats for your events. 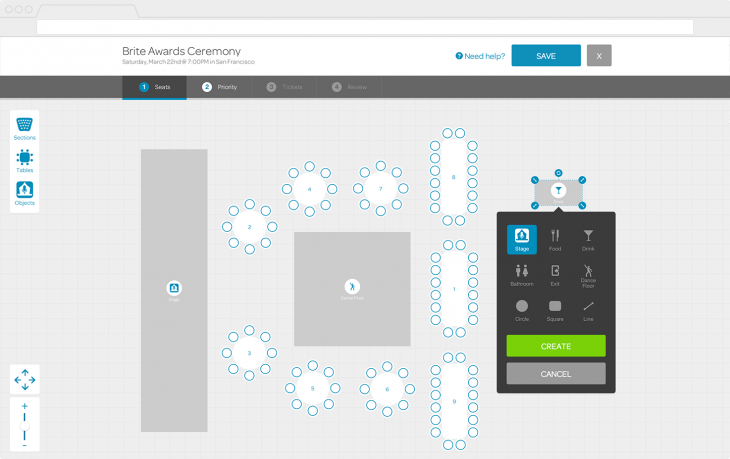 A Web tool allows hosts to drag-and-drop the layout of their venue in order to create seating maps. Once you specify where the focal point in the room is, Eventbrite can automatically calculate where the best seats are. Eventbrite has kept its pricing the same for reserved seating. It takes a 2.5 percent cut plus 99 cents per ticket, not counting credit card fees. Free events will remain completely free of fees. With the new feature, Eventbrite takes a substantial step toward challenging existing ticket sellers like Ticketmaster. While Eventbrite has gained adoption among smaller, independent events, its prior lack of reserved seating support held it back from use at larger venues and more formal events. That’s not to say that Eventbrite’s growth has been stunted. Last year, the company topped $1 billion in gross ticket sales. Free tickets represented an additional 70 percent of its business. Moving to reserved seating posed a technical challenge for Eventbrite, as each individual seat had to be managed as a separate inventory item. Issues like overselling, seat optimization, and keeping groups together had to be sorted out. Eventbrite says it overhauled its technology on the back-end in order to offer a quick and intuitive interface for seating and improve performance overall. Ticket sales have traditionally led to terrible experiences for consumers, so it’s great to see a company like Eventbrite pushing for innovation. I’m relieved whenever I see that an event planner has chosen to use Eventbrite, and today’s new reserved seating features should allow it to support a whole new class of events.